Some love it, some don't. D is decidedly in the don't category. Oh, well. I can't get over how absolutely handsome, cute, adorable your little boy is... SO CUTE! 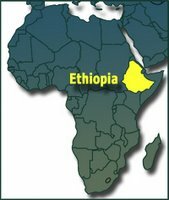 Check out the link to Ethiopia Treasure Hunt (she actually calls it Ethiodyssey now)... Cindy is a lawyer too :). After 6 months waiting, they got a referral for a 5 mo. old boy. They're with Gladney.